Note: The ports mentioned in the article are applicable for both Avi Controller and Service Engine communication with AWS Cloud. 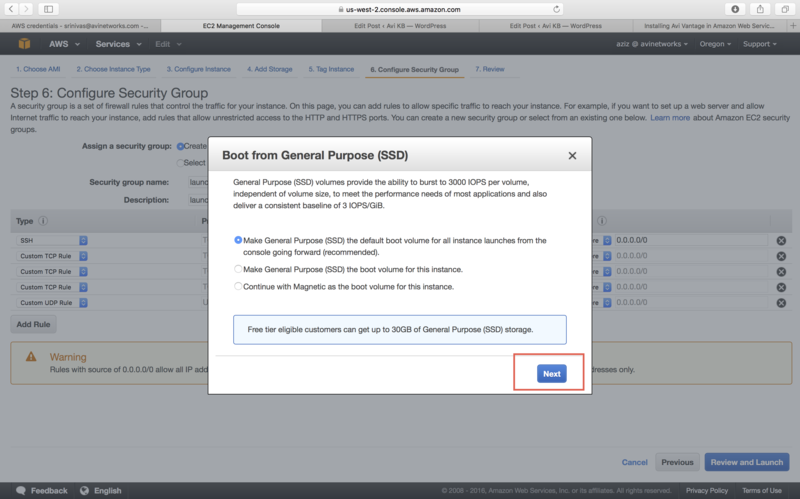 Note: The credential methods mentioned in this section are used during AWS cloud configuration. 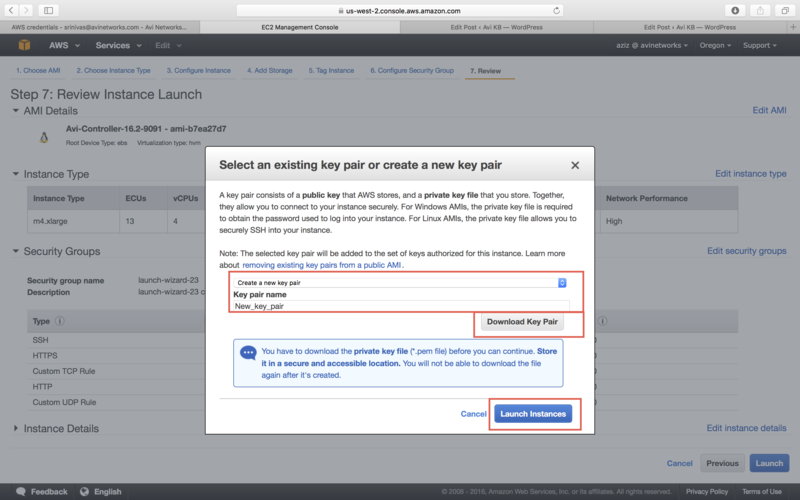 AWS customer account key: A unique authentication key associated with the AWS account. 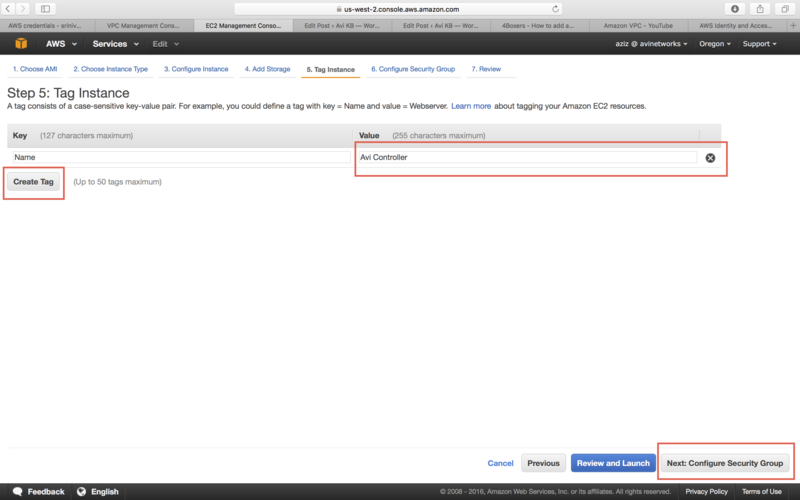 Access credentials are needed by the Avi Controller to communicate with AWS APIs. 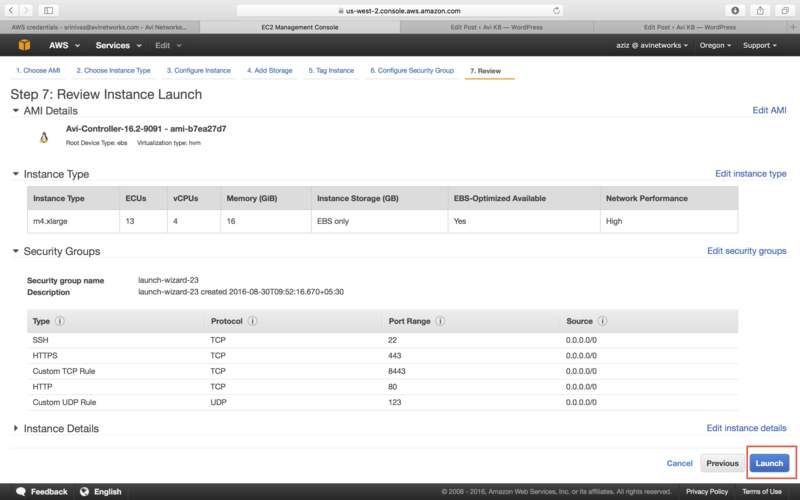 Note: AWS cloud configuration with Avi SaaS Controller only supports the Use Access/Secret Key credentials method. 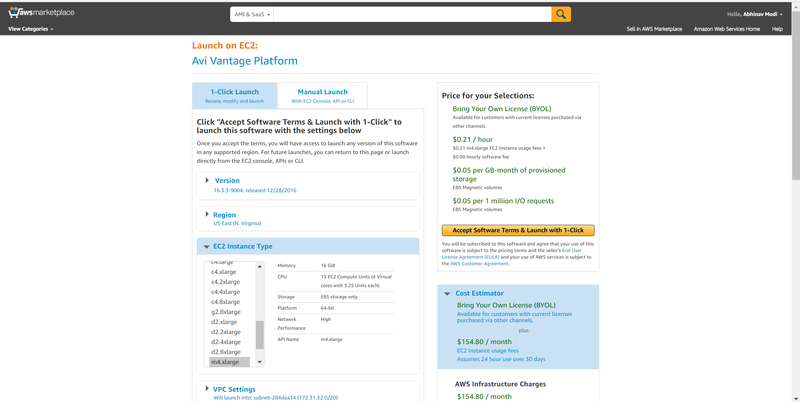 For recommendations regarding using access key on AWS, refer to https://docs.aws.amazon.com/general/latest/gr/managing-aws-access-keys.html. If you don’t have a key pair, create a new key pair. After downloading the key pair, change the permissions to “400” (chmod 400 “.pem”) to do SSH. If you have a key pair, select a key pair for AMI authentication. 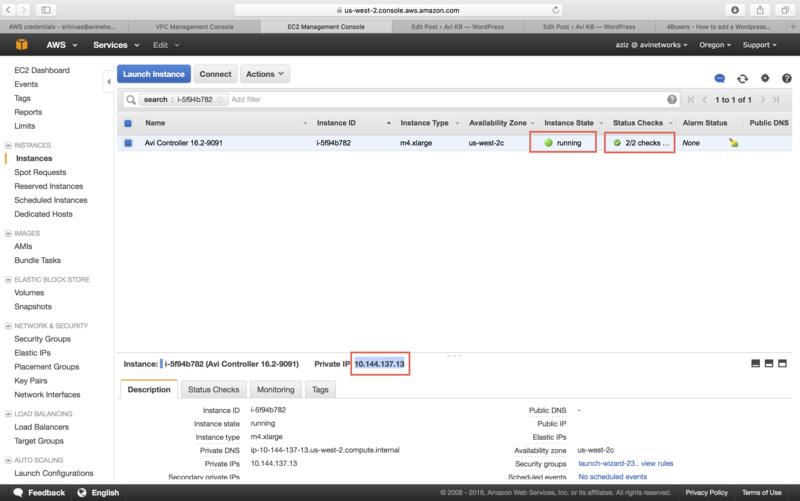 Select No Orchestrator to complete the initial configuration. 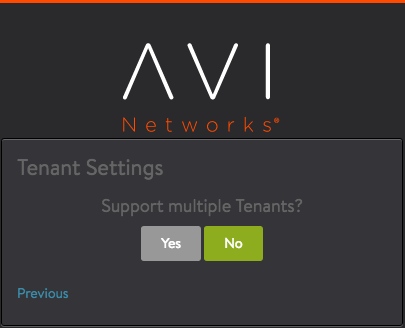 Continue by clicking on No for Support multiple Tenants (Multi-tenancy can be enabled later). Once the setup is completed, the browser will automatically refresh to the Avi Controller dashboard. This completes the installation process. 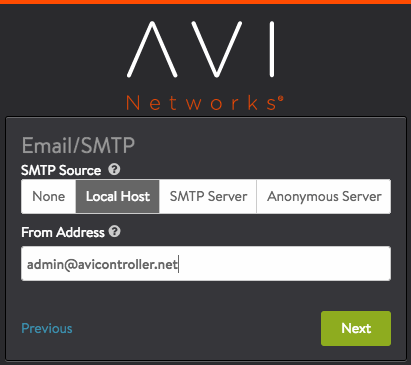 The Avi Controller is now ready for deploying virtual services. 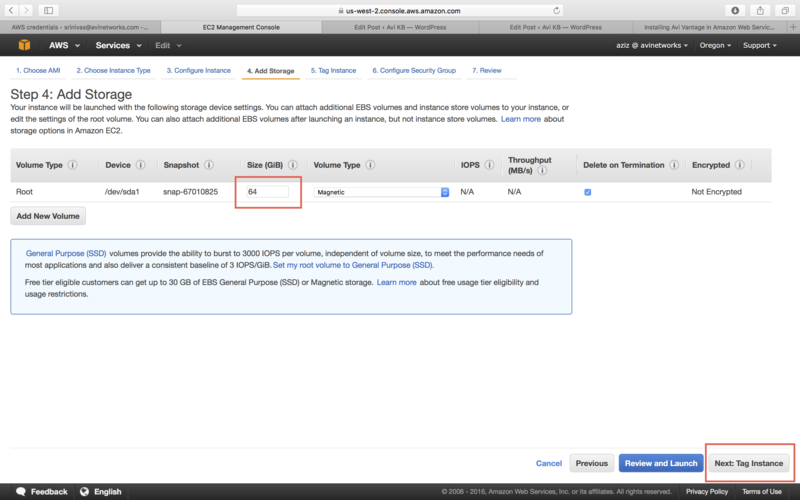 Follow the steps below to create a cloud configuration of type Amazon Web Services, so that Avi Vantage can spin up Service Engines in the required availability zones. 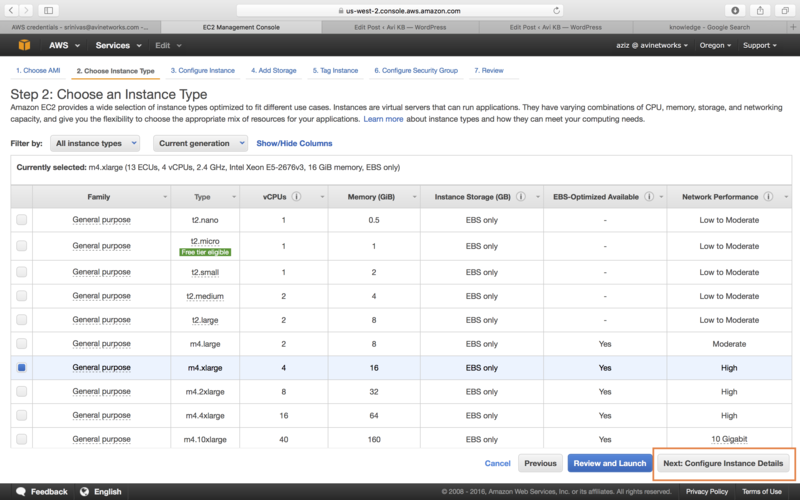 Navigate to Infrastructure > Cloud, provide the desired name, and select the cloud type as Amazon Web Services. Click on Next. Use the drop-down menu to select Region. 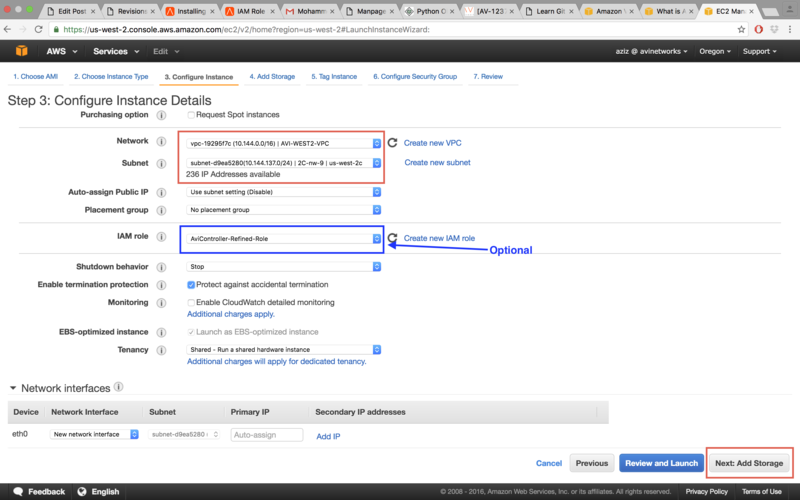 Enable the Access AWS through Proxy if there is a custom proxy between your corporate network and AWS. Provided details for Proxy Host and Proxy Port if required. 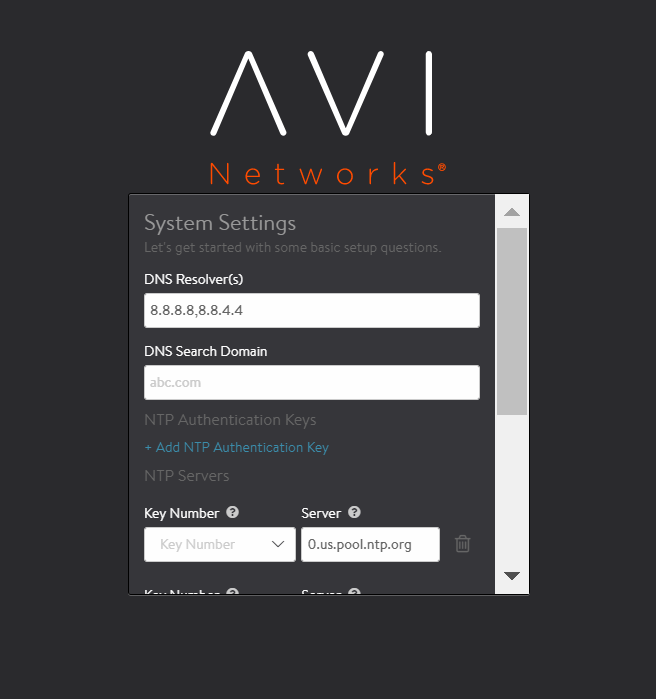 Access credentials are needed by the Avi Controller to communicate with AWS API. Provide Access Key ID, and Secret Key ID as shown below. Click on Next. 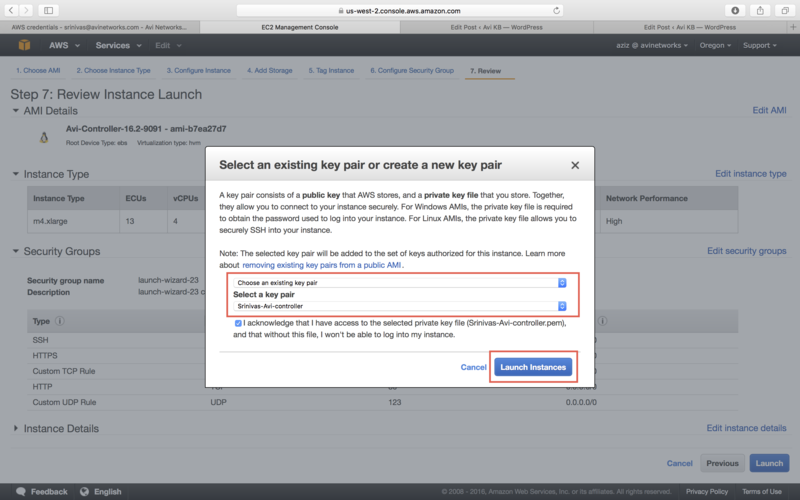 Note: AWS cloud configuration with Avi SaaS Controller only supports the Use Access/Secret Key credentials method. 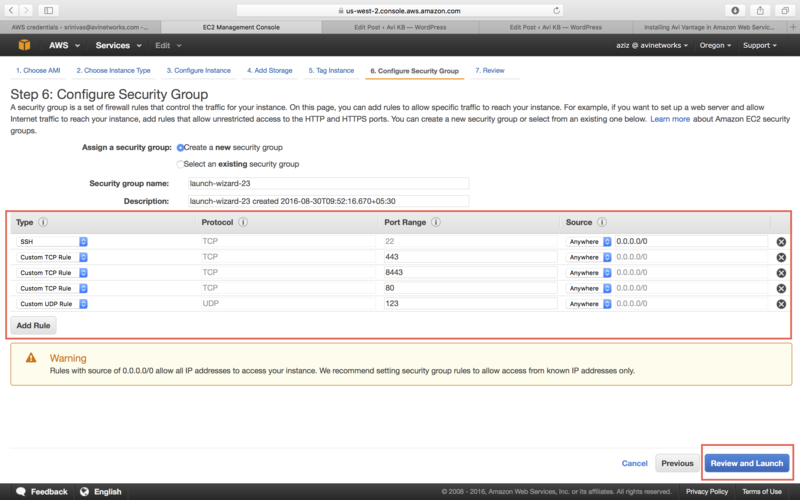 If using IAM roles, instead select Use AWS IAM Roles. Configure SE Management Network. This is the subnet in which the Avi Controller will place the management vNIC of SEs. 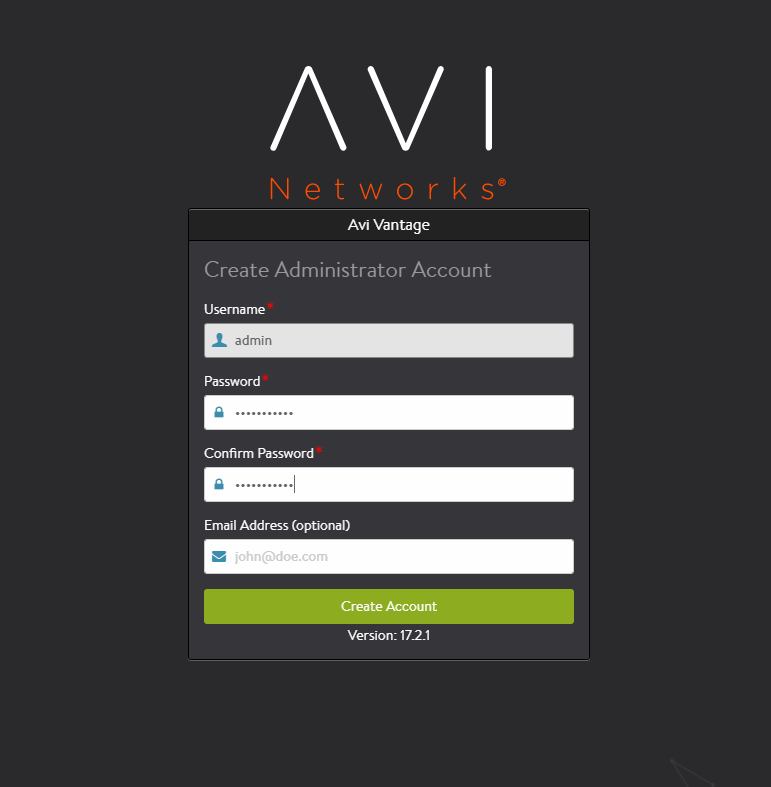 The management network of SE should be reachable from Avi Controller management IP address. Select the required Availability Zone, and SE Management Network. Note: While creating virtual service, make sure to select a VIP subnet that has reachability to the SE’s management subnet. Select the desired DNS Settings, and other settings as required. Click on Save once all the desired options are selected. IP Addresses Per Network Interface Per Instance Type shows the maximum number of network interfaces on a per-instance-type basis, as well as the maximum number of IPv4 and IPv6 addresses per interface.